On March 8th the pro-war group, Move America Forward, staged a rally at the Lafayette Hillside Iraq War memorial that was built and is maintained by anti-war activists. The rally was the groups first stop on a cross country caravan to DC. They used our spatial representation of the cost of the war to serve there agenda, unquestioning aproval of the Bush regime and continous warfare and attacking the peace movement as cowardly. Many of the Move America Forward protesters have or have lost love one in Iraq and as the blogger, Insane Begger, commented on my last post, they express their pain as anger at those who want to honor the soldiers but not the war. Perhaps, they see the Lafayette Memorial as simply an attack on the Bush war policy and not as an attempt to create a culture that is aware of what war really means. What comes across is there agression and as one anti-war activist observeded "I've never seen so much machismo on International Women's Day." 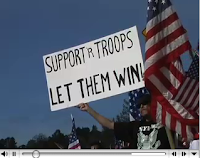 For sights and sounds from the Pro-War rally link to or download this video. 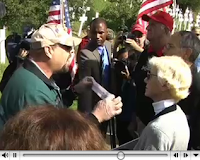 At the Move America Forward rally a Goldstar father found his son's name on a cross. Understandably, he became very offended that his son's name was being used for a memorial with goals that ran counter to his own politics. However he dealt with the situation in an agrressive and bullyish way using the situation to attack the anti-war movement and the memorial organizer. 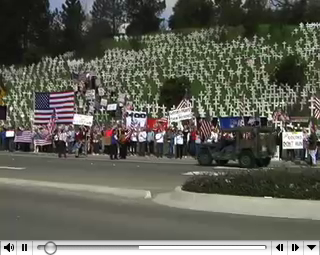 Memorial volunteers and Goldstar Mothers for Peace had put the names of fallen Californian soldiers on various crosses on the hillside. Among the volunteers the use of names was debated and the majority wanted them taken down. The anger of the pro-war Goldstar father brings into perspective the problem with having names on the crosses. The names and his anger at anti-war activists shifts the memorial to specific people and away from the policy of war in general. The altercation between the Goldstar father and anti-war activists also reveals the problem with the pro-war rally itself, it attacked peace-activists as people and did not address their goals for government and foriegn policy. For one story from the culture war link to or download this video. I question the true motives of the organization, Move America Forward, especially given the founders of MAF. Sal Russo is the chief strategist for Move America Forward. His public relations firm is Russo Marsh & Rogers (RM+R). This PR firm received a contract from the Kurdistan Regional Government (http://www.sourcewatch.org/index.php?title=Russo_Marsh_%26_Rogers): “The Kurdish contract was announced as Move America Forward, a group RM+R helped found and whose "chief strategist" is Russo, is going to Iraq. Move America Forward's "Truth Tour" is bringing conservative talk radio hosts to Iraq, to "report the good news on Operation Iraqi Freedom you're not hearing from the old line news media." To my way of thinking, that means MAF has a vested (money) interest in the continuation of the US occupation of Iraq, and that they are using PR techniques to create conflict in order to get media attention -- in other words, they callously used the Crosses and grieving families to get media attention. I have now seen two Letters to the Editor in the Contra Costa Times saying the site is not being maintained: one yesterday is the most recent by Michael Mediano of Walnut Creek was headlined, Hillside cross memorial is in disrepair. Is the site in disrepair? If not, then I have to assume this is a right-wing smear campaign. The crosses organizers had better write a letter fast and let people know that the Memorial is being attacked by a right-wing "swift-boat" smear campaign. a name be removed. But leavde the rest up. I note you never take any position. Why? I am on a personal basis, going to attempt to display on a large portable sign, all the names I can manage, maybe the most recent dead. I'll put this on a trailer or on my car, or hold it. think of the soldiers who may be killed in the next week. Personal feelings take second seat to ending the war.